TSKgel H series columns are recommended for the analysis of organic-soluble polymers and are packed with spherical particles composed of polystyrene cross-linked with divinylbenzene (PS-DVB). The TSKgel HT columns are for high temperature applications (<140 ºC), while the TSKgel HT2 columns are used in ultra-high temperature (up to 220 ºC) applications. 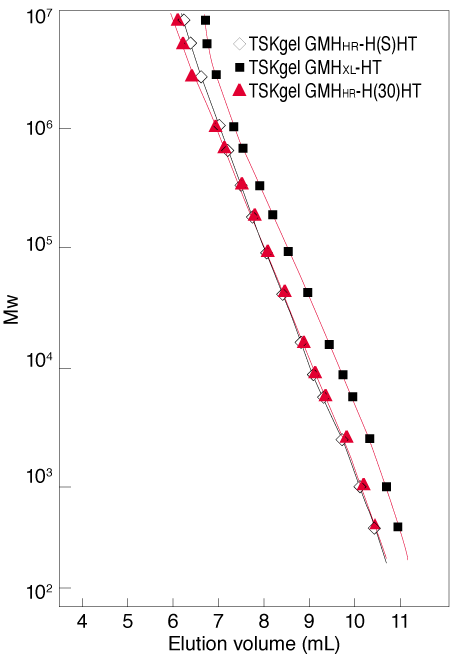 Please note: the "GM" prefix denotes a column packed with particles of different pore sizes blended to provide an extended linear calibration curve. TSKgel High Temperature columns are for the analysis of organic-soluble polymers. These columns are for applications up to 140°C and are shipped in o-dichlorobenzene (ODCB), which can be exchanged for 1-chloronaphthalene and trichlorobenzene. The TSKgel mixed bed columns are packed with particles of different pore sizes that are blended to provide an extended linear calibration curve. Mixed bed columns are used when a broad range of polymer molar masses is expected in the sample. 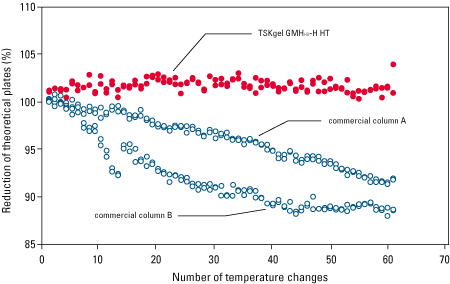 The issue of shearing that occurs with the analysis of ultra-high molar mass polymers is overcome by the TSKgel GMHHR-H(S) HT column. The (S) is a reference to this shearing effect.